The slopes of the Great Crater and most of the island are covered with thick bush, where are prevailing Genista tyrrhena a broom endemic of the Eolian islands and Ponza island. In the gardens of the town Piano survives another plant exclusive of the archipelago, the Cytisus aeolicus. This plant was already known as forage in Greek age: its qualities were in fact described by Theophrastus, which calls it "colitia of the Eolian". The citiso and other essences, especially oaks, constituted in the past a thick bush extended over much of the surface of the island. The Volcano landscape today is dramatically changed from its original appearance, and that as a result of which, starting from the eighteenth century, the island has made cultivable. Small patches of oaks, however, still survive in various locations in the Piano and the south, along the road to Gelso. The fauna includes some endemic: the more "frequent" meeting in summer evenings, around artificial lights, is the one with a small animal with a silked aspect, Anoxia moltonii called by the islanders "papaleo ". The larva can live many years in the ground, where it feeds on roots and plant substances; adults fly instead for a few months, gathering in noisy swarms, at sunset, for reproduction. Volcano was called by the Greeks "the island of Fire" where Gods produced weapons of the heroes. In more recent times, Campis reported that from the island are caming large quantities of wood, alum and sulfur. The mining, which began during the period of Romany, continued until at the age of Bourbons. After the fall of this dynasty, in 1860, the northern part of it was purchased by British Stevenson, who built a big house, reopened mines and planted the first vineyards. He built a track that ventured into the abyss of the crater, where they were manufactured masonry shelters for the workers. In 1888, the last eruption of the volcano convinced Stevenson to go and sell everything. The inhabitants of areas Gelso and Piano, peasants and shepherds were the last and only remaining to form the population. Starting of a rudimentary agriculture, mainly based on the wine has made grow interest in the beautiful island, which is now one of the favorite destinations of tourists in the Aeolian Islands. Overland Tours Vulcanello is a high 123 meters peninsula and sort after an underwater volcanic eruption. On this promontory vegetation is varied and, in the north, lies the Valley of Monsters, which takes its name from the particular forms of lava rock situated in the midst of black sand, shaped over time by weather. Black Sands, the most popular beach of the island, is located in the natural port of Ponente and is named for the fine black sand of volcanic origin. With a walk of about 2 km, it reaches the district of Lentia, located in the north-west of the island, from where you can admire the Etna and the islands of the archipelago. Since the beginning of the road leading to the plane is departing a path that climbs up to the edge of the crater. Going along a path in a northerly direction, we reach Cape Grillo from which, on a clear day, you can admire the nearest islands, the Church of St. Guardian Angels built in the thirties, and "Caves Ferlazzo" where more than ten years we celebrate the living crib. Lastly, following the road that from the plan reaches the south side of the island, we arrive at a small village Gelso, distinctive for its lighthouse and the beach. Trekking TO THE FOSSA of the forge: The forge of the Gods can be reached fairly easily. Once you get on top of the volcano, was overwhelmed by the acrid smell of sulfur gas; many, in fact, are the fumaroles and sulfur springs. The landscape, as lunar still traces of past volcanic eruptions. Along the descent is advisable to stop near the puddle of mud. Tours by sea Starting the round from Port of Levante, distinctive for its fumaroles and for the termal springs. By route towards the northwest it bypasses peninsula of Vulcanello; passed the channel that separates Vulcano and Lipari continuing to go along the island to the south, it reaches the Horse Cave, where the reverberation of sunlight creates fantastic games light and color. Continuing on the journey, we arrive at the lighthouse, at Gelso, and continue doing return to the port of Levante. The Landslide of the archipelago. It starts down the stretch of coast that divides two hotels built on the coast. The seabed drops very gradually for several tens of meters, forming a broad plateau between 3 and 10 meters, covered by an alternation of small rocks and large field of Posidonia. Moving then to Lipari, follows a direction perpendicular to the coast, to identify the beginning of a pretty steep descent. The first meters, between 10 and 20, are characterized by the presence of small stones. Once past this stretch, stand up to between 35 and 45 meters deep, the size of the boulders increasing definitely making much more spectacular backdrop. The Wall Sirenetta Descend along the slopes of an active volcanic cone is not an experience that happens every day. The point of the launch is the port of Volcano: skirting the island for several hundred meters, at some point get a large rock, overcoming the statue of a mermaid that emerges. It is located on a rocky platform that suddenly gave way to a dizzying wall, a few meters from the edge, the bottom starts to degrade rapidly. The bastions of black lava fall toward the sand, which in turn goes to the depths, following a high gradient: for about fifteen meters deep it is worth doing everything around the rocks of the Little Mermaid, characterized by large boulders supported on the bottom. In some place the sand is yellow-red; is seeng even gaseous emissions and hot water dating from the seabed. Following the boundary between the rocks of the coast and the beginning of plane, they are some cavities. Capo Grosso Capo Grosso is a bizarre structure rocky stretches to the open sea as if it were a fortress built to prevent waves from the south. The wall is absolutely vertical on each point and not ever drawn flat on which find support. The descent into the depths highest is sudden. The most evocative of this immersion is a kind of ramp carved into the rock wall completely covered with Astroides. The rock Quaglietto The cove that opens between "Capo testa grossa" and the Rock Quaglietto is certainly one of the most beautiful of all the archipelago. Discover beautiful pools from natural water crystalline emerald color, the place is known as the "bathroom of theVirgins" . At the end of the cove opens a large cave, which you enter by boat, named Horse Cave. At the center of the cave, resting on the sandy bottom, stands a statue of a Madonna, perched on a Club of divers. At the end of the cavity meets a flock of red shrimp. Capo testa grossa Observing from the sea, we will notice that this is a massive extension that ends with a rather elongated wall, which descends into the sea with a north-south trend. From here you can descend into the water to the north of the head, near the rocks. Inside the creek, the rock falls in peak form a vertical wall where there are beautiful sponge colonies. In the tip we find ia really impressive: the wall descends vertically in the water but it is very articulate. The rocks are jagged peaks in channels and indentations. This imposing morphology continues for several meters, at depths up pretty high, exceeding 50 meters. Vulcano and Stromboli are the only island of the Eolian arch with current volcanic activity. The Volcanism of this island began during the Upper Pleistocen, giving rise to the formation of strato volca central "Volcano primordial." The first round of activities ended with the collapse of the Caldera of Piano, partially filled by products of intense activity. The formation of clusters riolitici and alcali-riolitici constituting the Mounts Lentia took place later, in late Pleistocen. The formation of the caldera which hosts the active cone in the Vulcano pit, can be attributed to dell'Olocene. 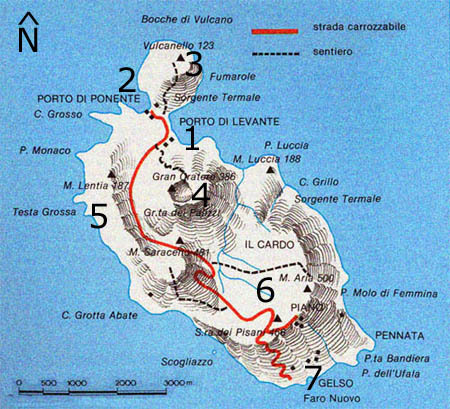 For a volcanic activity historical (183 BC - 1550 AD) is accounted the formation of the peninsula Vulcanello. Based on the evidence is suggested a deep origin of primary magmas from Volcano, which would be produced by partial melting of the mantle, above the subduction zone. The eruption of Volcano is a late stage in dynamic of the aeolian arch and as such clearly differs from that which produced the oldest islands . The current seismicity, with focal depth between 200 and 350 km in the arch, shows a significant correlation with the potassium of active volcanoes in this area. The "Pozza" thermal located within walking distance from the port on the island of Vulcano is fed, continuously, from countless bubbles from which sulfur vapor leak, sea water and mud with sulfur. These are the three basic components of the bathroom and explain how it is virtually impossible to develop any pathogenic forms.